The Alpha HSM, which features modular construction, is a high-speed labeling system that can be configured in a variety of models to handle multiple speeds and label sizes. Every packaging line is different, so Weber engineered the modular Alpha HSM so that it can be ordered in ten different versions to fit just about any labeling application. Available in right- or left-hand versions, the Alpha HSM has 5.3” (135mm), 7.8” (200mm), 9.8” (250mm) and 12.6” (320mm) label width versions. The HSM can keep up with line speeds up to 500 feet/minute. With a labeling accuracy of ±0.01”, the Alpha HSM can handle labels as small as 0.39” x 0.39” (10mm x 10mm) and up to 12.5” x 78.7” (320mm x 2000mm) (W x L). Depending on the label width configuration, the HSM can use label rolls up to 19” in diameter on 3” diameter cores. 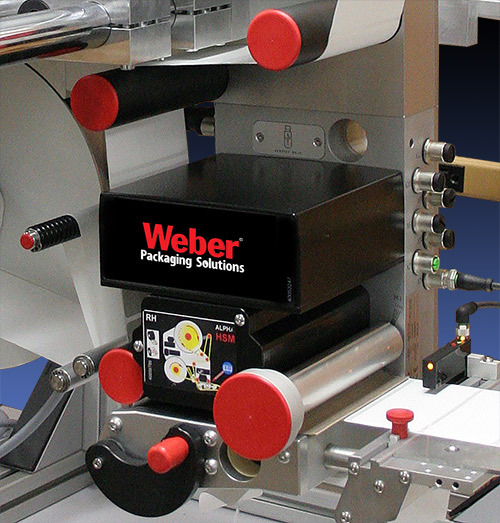 Weber's Alpha HSM features high-speed labeling in a modular design for faster labeling speeds and more flexibility in application. The modules consist of a drive module, a label detection module, a dispensing module, an unwinder module, a rewinder module and an adapter module. These can be assembled according to a customers specifications using our configurator to create just the right label applicator for their product line. As you can see in the models listed above, the standard mechanical label unwinder and rewinder can be upgraded to a motorized servo-controlled system for higher labeling throughput speeds. 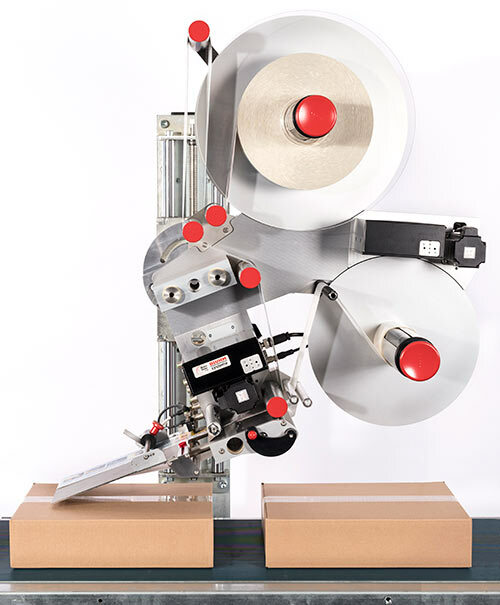 Label application modules for the HSM include a fixed peeler plate, a swiveling peeler plate, a pneumatic peeler plate, and adjustable peeler plate or a pneumatic applicator. Label sensors can handle standard and transparent labels.